Trinity College's American Religious Identification Survey (ARIS) is out today and it shows that people who do not identify with any religions now stands at 15% of the population, behind only the Catholics and the Baptists. You can play with the data with some cool graphics here. The survey also has data points from 1990 and 2001 - so you can gauge some trends. The percentage of Americans claiming no religion, which jumped from 8.2 in 1990 to 14.2 in 2001, has now increased to 15 percent. Given the estimated growth of the American adult population since the last census from 207 million to 228 million, that reflects an additional 4.7 million "Nones." Northern New England has now taken over from the Pacific Northwest as the least religious section of the country, with Vermont, at 34 percent "Nones," leading all other states by a full 9 points. • The Muslim proportion of the population continues to grow, from .3 percent in 1990 to .5 percent in 2001 to .6 percent in 2008. 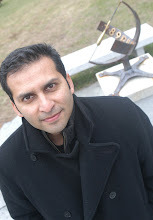 • The number of adherents of Eastern Religions, which more than doubled in the 1990s, has declined slightly, from just over two million to just under. Asian Americans are substantially more likely to indicate no religious identity than other racial or ethnic groups. • Those who identify religiously as Jews continue to decline numerically, from 3.1 million in 1990 to 2.8 million in 2001 to 2.7 million in 2008--1.2 percent of the population. Defined to include those who identify as Jews by ethnicity alone, the American Jewish population has remained stable over the past two decades. Only1.6 percent of Americans call themselves atheist or agnostic. But based on stated beliefs, 12 percent are atheist (no God) or agnostic (unsure), while 12 percent more are deistic (believe in a higher power but not a personal God). The number of outright atheists has nearly doubled since 2001, from 900 thousand to 1.6 million. Twenty-seven percent of Americans do not expect a religious funeral at their death. 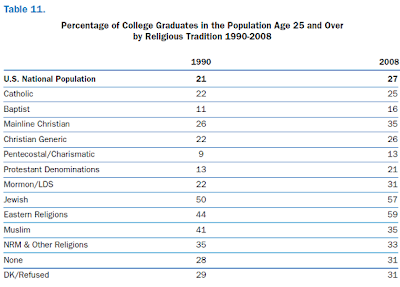 And just in case you are wondering, percentage of college graduates over the years has gone up for all groups except for two: Muslims and New Religious Movements (NRM). Ouch! It seems that Muslims and Raelians are duking out for this exception to the rule. Since the Muslim proportion of the population has also doubled, I'm curious if this drop in college-educated fraction is because of a new influx of immigrants on a large scale or because of conversions in the US.